Here at A Wildlife Pro in Philadelphia we specialize in the removal of unwanted nuisance wildlife from residential homes and commercial buildings. We most commonly deal with the removal of critters from attics, but we deal with all facets of wildlife removal and control. Common scenarios that we deal with include - the removal of squirrels from the attic or soffit of a house - the removal of raccoons from attics or chimneys - the removal of a colony of bats from inside a building - bird and pigeon control at commercial properties - total rat and mouse control - general wildlife trapping (groundhogs, skunks etc). We not only remove all nuisance wildlife species, but we perform preventative repairs to houses and buildings, to make sure that wild animals do not get back in. We also provide wildlife cleanup services. Give us a call any time at 610-927-7792, and we can schedule an appointment. 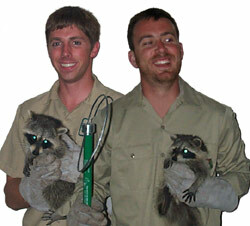 Critter Trapping - We aim to be humane and 100% effective. We capture only the target animals. We don't waste time and money by catching every roving critter in the area. We catch the ones that are causing you problems. If you have squirrels in your attic, we set special traps right at and on the holes they use to get into the house. We also treat animals humanely, and we work 24-7. We never leave an animal to suffer in a cage for too long. We come out to the house seven days a week to remove the trapped animals. Animal Trapping: We trap and remove all major species of nuisance wildlife, such as raccoons (as seen in the picture to the left) to skunks (we use special traps that prevent them from spraying) to squirrels (we mount the traps on the roof or at the holes to catch all of the target animals) to opossums, groundhogs, and more. We set several traps on the property, and always come as soon as possible, seven days a week, to remove and humanely relocate the trapped animals. Trapping is a specialty task, and it requires the correct equipment and technique, as well as licensing. Bird and Bat Removal: We specialize in particular in the control of bird and bat problems in southeast Pennsylvania. The most common colonizing bat species here is the Little Brown Myotis. They form very large maternity colonies, often of thousands of members, inside of buildings and chimneys and attics. We safely remove them all, kill none of them, and bat-proof the structure so that the problem is solved permanently, with guarantee. We also do pigeon control in the city, to keep birds from roosting and pooping in unwanted areas. We also do cleanup. Rodent Control: If you have a rat or mouse infestation, we take care of it better than any other company in the area. We don't resort to the use of poisons like the pest control and Philadelphia extermination companies do. That approach doesn't solve the problem. We solve your rodent problem permanently, 100% for good, by sealing off any and all entry points into the building, and by physically trapping and removing the rats and mice. This is a much better approach than poison control methods! Animal Damage Repairs: This is probably the most important step in permanently solving a wildlife problem in a home. If the squirrels were living in your chimney, after we get them out, we install a steel chimney cap to keep any future squirrels out. If you have raccoons in the attic, we repair the damage and seal shut the areas they've ripped open in order to get inside. If a groundhog has dug under the shed, we can install a steel screen around the perimeter to keep future critters out for good. Without repairs, the job is not complete. We also provide dead animal removal services - if you've got a terrible smell inside your house, and you suspect that an animal has died - it could be a rat down in a wall, a squirrel that fell down the chimney, a raccoon in the attic - we come and find and remove the carcass, and provide odor relief. We also provide dead deer removal services for a fee - cases such as a deer in your backyard, not a case of dead deer by the road. Montgomery County Animal Control - The county animal services deals with domestic animal complaints, such as barking dog problems, dangerous pets, animal adoptions, stray cats, and so on. They will not help out with wildlife issues, particularly if you need a real solution to a real wildlife problem, such as critters up in the attic. If you have a problem with a cat or dog, call the county. If you have a problem with wildlife, give us a call. We service the greater Philadelphia area, including Delaware, Chester, Montgomery, & Philadelphia Counties. We service the towns of Upper Darby, Lansdowne, Broomall, Media, Brookhaven, Chester, Concordville, Newtown Square, Downingtown, West Chester, King of Prussia, Audubon, Norristown, Conshohocken, Willow Grove, and more. Click Here for an approximate map of our normal service range. We do travel further for larger jobs, or schedule permitting, so if you are unsure about our service range, just give us a call! What Prices Do We Charge? Unfortunately, there's no one-size-fits-all type of pricing. Each job is different, and depends on a variety of factors. We are a simple two-man operation, and we charge significantly less than the larger franchise-based wildlife and pest control companies in the area. And we are wildlife specialists only. We are not Philadelphia exterminators, and extermination companies deal with insects, and do a bad job of wildlife control. We typically charge a service fee to inspect the home and property and set traps, and additional fees for damage repairs, cleanup, and other wildlife control tasks. The best way to get an accurate idea of price is to call us and describe your situation, and then we can give you a price quote over the phone. If you need a service professional for something other than wildlife removal, click here for our list of other Philadelphia Services, such as a plumber, electrician, lawn service, heating/cooling, concrete, painting, roofing, etc.